Cape Leveque is a tiny Aboriginal settlement on the northern tip of the Dampier Peninsula which comprises a good quality restaurant, camping (but no caravans), a lighthouse and beautiful white beaches set against red cliffs and crystal clear blue waters. Access is not easy. The unsealed road from Broome attracts enough 4WD and bus traffic to ensure that it is commonly seriously corrugated in the winter and impassible in the summer months when cyclones and "the wet" ensure the road turns to mud. The trip is worth the effort. The church at Beagle Bay, which is on the way, is particularly impressive and Cape Leveque is an isolated tropical paradise, particularly in the winter months. 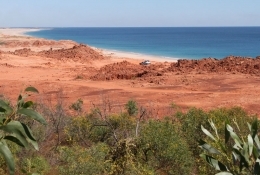 Cape Leveque is located 2533 km north-east of Perth and 209 km north (on a mainly 4WD road) of Broome. In 1803 the French explorer, Nicolas Baudin, sailed along the coast and named Cape Leveque after his hydrographer, Pierre Leveque. 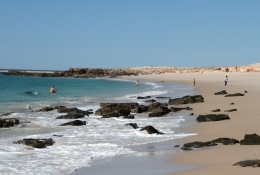 Located 209 km up a dirt road (for 4WD vehicles only - and no caravans) is Kooljaman Cape Leveque, described on its website as "a remote wilderness camp owned and run by the Indigenous Bardi Jawi Communities. Situated on native title land, the locals invite you to share the astonishing diversity, pristine wilderness and unique landscape that celebrate this award-winning place as a once in a lifetime experience." It neatly sums up the activities in the area describing how "Guests can enjoy snorkelling with a beautiful array of tropical fish life, swimming in crystal clear blue waters, fishing, photography, beachcombing for unique shells, mud crabbing, learning about bush tucker, scenic flights over the Buccaneer Archipelago, charter boat trips, whale watching, bird spotting or the most popular activity of all – doing nothing but soaking up the sheer tranquillity and beauty of the surrounds." It is an area of exceptional beauty with the white sands and blood red cliffs against the blue seas. Check out http://www.kooljaman.com.au for details and bookings. Located on the path from the Kooljaman Restaurant to the local beach, the Cape Leveque Lighthouse is located behind a high fence on a rocky outcrops. The WA Heritage website (http://inherit.stateheritage.wa.gov.au/Public/Inventory/PrintSingleRecord/06b7e9e3-7d12-4e58-852d-05008f3e6f4e) explains: "The whitewashed circular building tapers to an external steel bracketed perimeter deck off the top element that is mostly glazed to facilitate the beacon light from within. The apex has a metal dome. The design of the prefabricated cast iron lighthouse tower is finely conceived and executed. The tower 13.1m high. The building was commissioned on 9 August 1911, and was one of ten lighthouses built on the West Australian coast between 1900 and 1913, most of them on the North West coast. At this time, the provision of lighthouses was still the responsibility of the State, but the control of all coastal lights passed into Commonwealth hands in 1915. 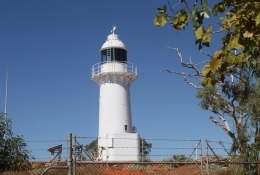 Cape Leveque lighthouse tower was manufactured in Perth. Construction of the lighthouse and associated quarters cost £9,219. The lighthouse was fitted with a third order, dioptric triple flashing white light, which was visible for 18 nautical miles in fine weather. The light was fuelled by kerosene and the lighthouse was manned by two light keepers. The tower is the only prefabricated cast iron lighthouse designed by the Public Works Department and manufactured locally by Bela Makutz .The RAAF had a base near the lighthouse during World War Two, and an airstrip was built nearby in 1955. The lighthouse was modernised in 1965/66 with a new light and a non-directional radio beacon and the old quarters were replaced with two steel-framed, two-storey residences. The original light was given to the WA Museum. In 1985, the lighthouse was converted to solar power and automated, with a new light. A Racon beacon was installed. This beacon has a range of between 10 and 20 miles, less than a radio beacon, and is used by ships equipped with radar." Located 16 km south-west of the Kooljaman Eco Resort, is the Cygnet Bay Pearl Farm. It offers a range of accommodation options including a pearling shack, safari tents and a campground (no caravans) and it is possible to explore the Pearl Farm, the Dampier Peninsula and the Buccaneer Archipelago from the farm. It is also possible to visit the pearl farm, see how pearls are made, watch the staircase to the moon and relax beside the infinity pool. Tours include a Pearl Farm Discovery, a lesson in carving pearl shells and a demonstration of pearl grading. The local Bardi people also offer a cultural tour around the tidal flats and a cruise through the islands of he Buccaneer Archipelago. For more detailed information check out http://www.cygnetbaypearlfarm.com.au. The Sacred Heart Church was built from local materials with the older Aborigines making some 60,000 bricks in a home-made kiln with the help of Pallottine Brother Wollseifer. The Aborigines living at the mission collected trochus and giant clam shells which the women cooked to make lime for whitewash. The ‘Children of Mary’ made work clothes out of flour bags to protect their good dresses while building and making whitewash. Broome pearlers donated pearl-shells. Brothers Helmprecht and Krallmann looked after the mission cattle which provided an income. Brother Graf provided all the carpentry and joinery from local timber and Brother Wollseifer was considered the ‘chief architect’ of the church which was designed to be large enough to seat 200. Father Droste and two boys, the ‘crippled’ Joseph Neebery and Joseph Gregory, laid out the altar in shells and pearl-shell. Writing about the church Sister Brigida Nailon explained the altar's iconography: "At the centre is the innocent Lamb of God, flanked on the right with a Greek cross and on the left with a Roman cross. Cowrie shells frame the altar and tabernacle and pearl-shells form the inlay. The chalice carved by Fr. Droste reads ‘Dominus Deus et Deus Meus’ (‘My Lord and My God’), a reference to Doubting Thomas who eventually confirmed the miracle of trans-substantiation. The original floor tiles were laid out in squares divided by illustrations of bush fruits and animals and weapons. The original ceiling was made from wood and plaster ‘set with shells to resemble the sky’. Fr. Doste carved an ebony wood cross decorated with shell to top the arch of the Sanctuary, which is flanked by two angels holding scrolls ‘Christus Vincit, Christus Regnat, Christus Triumphat’ (Christ Conquers, Christ Reigns, Christ Triumphant)." Later additions to the church include a redgum communion rail by Br. Frank Hanke, coloured glass windows donated by Bishop Raible, and the doors and furniture of bush timber made by Br. Joseph Tautz. In the 1920s one of the Salesian priests suggested flattened kerosene tins to reinforce the roof against white ants. Br. Stracke recalled the church as it was in the 1930s with the recycled tin ceiling and without the ornamental floor: "The shell church, they made it of mud bricks, collected shells to get lime for mortar and the whitewash. Even the floor tiles were made in Beagle Bay out of mud. Now it’s a cement floor. ... The Germans had to be quiet during World War I so they built this church to show they are here for a mission. The Beagle Bay church had a ceiling made of four gallon tins, [they] flattened the kerosene and petrol tins, and painted a design on it." The building was completed in 1917 and a team of Aboriginal women decorated the interior with mother of pearl, cowrie, volute and olive snail shells. The result is a unique church which mixes Christian symbols, European mosaic techniques and "saltwater people" totems: dingos, snakes, emus, fish, shields and spears. Fr. Creagh and Fr. Bachmair dedicated the new church on the Feast of Assumption, 15 August 1918. The main attractions are the central altar and the two side altars - altars to Mary and Joseph. The St Joseph's side altar features a pearling lugger on wild, tropical seas. Of particular interest are the fourteen Stations of the Cross which have been painted on aluminium sheets to survive the climate and white ants by a German nun, Sister Roswina, in Munich. She had witnessed the bombing of Hitler's Third Reich and it is incorporated in the eighth station which shows the destruction of Jerusalem. They are all framed by shells on picture frames made by Brother Franz Hanke. There is an excellent brochure, available at the church, which explains that the Stations of the Cross have: "The strong themes of sin and redemption are played out not only by the actions of Christ in the foreground but also by the characters, many of whom are Aboriginal, in the background. Observe that the ringleaders appear closest to Pontius Pilate in the first station looking not at Christ but at Pilate, calm while all around them are in a fury. In the second station the followers of Christ run away by going to the bush. The third station depicts the three attitudes of sin, shock, determination and sorrow, in the faces of the three men whipping Christ. This play of major and minor themes continues throughout the stations until in the last station where redemption is achieved and holiness made possible by the death of Christ and is symbolised by the only appearance of halos on the saintly figures." * Prior to the arrival of Europeans the coastal area was home to the Bardi Aboriginal people. * In 1688 a Captain Read sailed down the coast of the Kimberley and around King Sound in the Cygnet. One of the crew was William Dampier who, when he returned to England, wrote A New Voyage Round the World. Dampier recorded: "This part is all a low, even land with sandy banks against the sea … the points rocky and so are some of the islands in the bay… The soil is dry and sandy, destitute of water, except you make wells, yet producing divers sorts of trees." * Dampier returned to the area in September, 1770 as master of the Roebuck. * In 1803 the French explorer, Nicolas Baudin, sailed along the coast and named Cape Leveque after his hydrographer. * The explorer Phillip Parker King passed along the coastline in August 1821. * In 1838 John Clements Wickham, who was surveying the coast, named Beagle Bay after the survey ship he was captaining, the HMS Beagle. * By the 1870s pearling facilities were established at Roebuck Bay, now modern day Broome. * It wasn't until 1879 that Europeans began to settle the area. That year the explorer Alexander Forrest travelled through the area and sent back glowing reports of the area around Derby which described the district as being "well watered land suitable for pastoral purposes, besides a large area suitable for the culture of sugar, rice or coffee". * By the 1880s Broome was nothing more than a few pearlers, some pearling luggers, a few shanties and some local Aborigines in the area. * By 1923 there was a road from Broome to Beagle Bay and Cape Leveque. * In 1942 the Japanese invaded the coastline. * In 1946 Dean Brown decided to establish the pearl farm, Cygnet Bay Pearls. * In 1957 another cyclone, with winds of 193 km/hr, ravaged the coastline. * In 1960 Brown was able to harvest his first crop of cultured pearls. * By the 1970s the Brown family had introduced fibreglass luggers and modern diving equipment to their operation. * In 2004 Cygnet Bay Pearls grew a pearl the size of a golf ball. * In 2009 Cygnet Bay Pearls opened a shop at Cygnet Bay. * In 2010 the Kimberley Marine Research Station was created at Cygnet Bay. There is no Visitor Centre at Cape Leveque. The closest is the Broome Visitor Centre, 1 Hamersley Street, tel: (08) 9195 2200. Open 8.30 am - 4.30 pm. Check out http://www.kooljaman.com.au/ which offers excellent meals, a genuine local Aboriginal experience, and outstanding, 5 star bush accommodation. There is also the Cygnet Bay Pearl Farm. Check out http://www.cygnetbaypearlfarm.com.au/ which also offers upmarket meals and accommodation. A useful history is contained on the Kooljaman site. Check out https://www.kooljaman.com.au/about-us/history.